Fall is just around the corner (first day of it is Sept 23rd!) are you and your pond prepared? Knowing how to transition your pond throughout the different seasons is very important. As air temperatures begin to drop, so do water temperatures which subsequently alter the needs of the fish living in the pond. It is essential to protect the fish from their ever changing climate and surroundings, including falling debris and decaying leaves. All of the fallen debris and leaves could also clog your lake fountain, pond aerator or intake screen so it’s especially important to keep an eye out for this. In most parts of North America, water temperatures start to drop in September and October (hate to bring you back to reality, but that’s now!). It’s important to monitor with a thermometer. It’s also important to start changing the diet for your fish to accommodate the changes the fish are about to endure. You need a food that is highly digestible at low temperatures. This is to accommodate In the colder months, when the fish’s metabolism is reduced. Fall is great for cleaning your pond. (Anytime before the temperature reaches 50F). The reason is this is the time that the fish are still active and less likely to be injured during the cleaning process. Scoop up fallen leaves for the surface with a fine net. You may choose to even pump out some of the water out of the pond to expose the planting shelves around the pond. This will make it easier to hand remove leaves that are now stuck to the pond edges. You could also use a hose to spray them off; just remember to collect them afterwards. 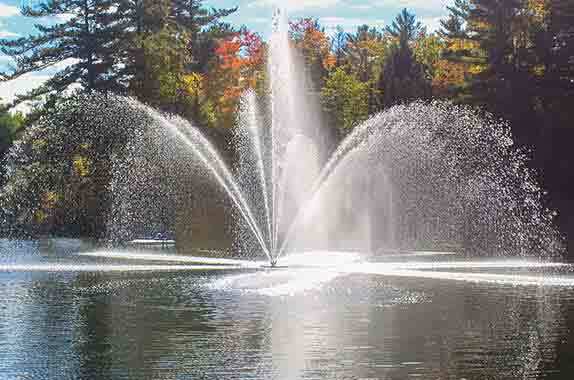 Ensure there is always enough water in the pond to accommodate for your pond fountain and/ or aerator! This might also be the time when you decide to remove your lake fountain or pond aerator or decide a time in the near future to remove them before the water has a chance to freeze. Now you can take in the beauty of the changing colour of leaves and listen to the sounds your lake fountain or pond aerator create, because once winter hits you won’t be able to enjoy the beauty and sounds until Spring!